Why do we write GOV.UK in capitals? And why is the URL written lower-case? You may well have heard the reasons, but we've never actually written them down. Let's fix that now. When we were thinking about names for the government website we came up with a number of ideas, but soon realised it already had an identity people knew – that little bit of the end of the URL, gov.uk. To formalise the name we simply put it in capitals, GOV.UK. We did that because we want it to be absolutely clear that this is the name and identity of the government website. So, when using the name of the government's website, we use upper-case: GOV.UK. But, when we want to tell people the URL, we want it to look like a URL, so we put it in lower-case, with the three w's: www.gov.uk. So that's it in writing. When writing the name, GOV.UK, please use capitals. When writing the URL, www.gov.uk, please use lower case. Thanks. When we put this post up, one of the first questions someone asked in the comments under that post was: how should we say it out loud? "Use all capitals if an abbreviation is pronounced as the individual letters (an initialism): BBC, CEO, US, VAT, etc; if it is an acronym (pronounced as a word) spell out with initial capital, eg Nasa, Nato, Unicef, unless it can be considered to have entered the language as an everyday word, such as awol, laser and, more recently, asbo, pin number and sim card. Note that pdf and plc are lowercase." However I do whole-heartedly agree with your pronunciation: “guv dot yew kay”. I hope this finally puts an end to those who habitually refer to the website as "govv dot yew kay". Most recent internet brands have a unique word as their name that when searched for cannot be confused for any other brand or property. With those that don't, they have a name (The Guardian) and a domain (www.guardian.com), which give two shots at searching intelligently in relation to that site. You have chosen a name that gives neither advantage. Have you any solutions to this problem? I will be pleased to learn that I am mistaken in thinking that the most web-savvy site in government chose a name that functions, in respect of search, anomalously from every other site name and domain name on the internet. I'm a pedant and a taxpayer who gets irritated when people mis-spell names or write telephone area codes incorrectly. So I'm grateful you've taken a tiny amount of time out of your working day to write this very short article that goes some way to ensure consistency in the use of the name of this vital public service. Don't you have better things to be doing in the Civil service than write articles on the best use of capital letters? Hi Rob. It may be implicit for some, but perhaps not for everyone. The www just reinforces that it's a URL for as many people as possible. Any reason for specifying "www" when it's largely implicit in a website's URL these days? It is a month late for an April fool and the story of 'The KIng with no clothes' springs to mind. If people get paid for this sort of tosh it is very worrying. Saying the dot aloud is best. "GOV dot UK". It reinforces that it's a website, and what the address of the website is. We used to not say the dot, but found that caused confusion. Better to have minor confusion as to whether we're referring to the name of the website or its URL than confusion around the URL itself. Please say the dot. Thanks. It might be easy to confuse the URL with the brand when spoken. Should we speak the GOV.UK in a Brian Blessed manner to help customers differentiate? thank you. 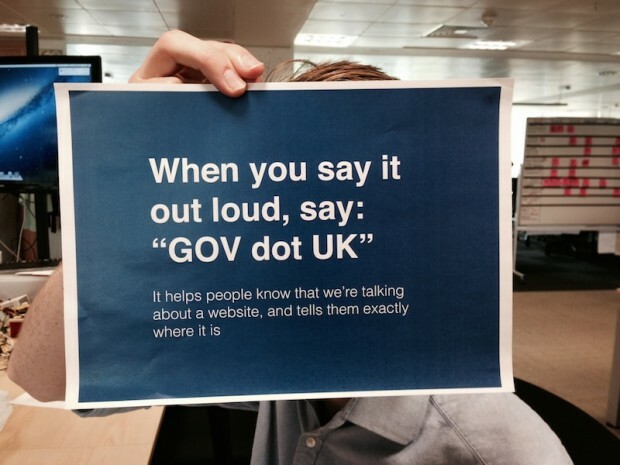 When you say it (in speech), do you say " gov uk" or "gov dot uk"?